Marmosets are a type of monkey. They are several species of marmosets in the genus Callithrix. They have distinctive large ear tufts and their tail is striped, with alternate wide dark and narrow pale bands. Their coat is grey, black, brown and white with streaks of orange. In the wild they live in small family groups of 3-15 individuals. Their day is spent socializing, finding and feeding on gum, insects, lizards, snails, fruit, flowers and nectar while staying alert to danger. Enrichment aims to improve welfare in captive animals. It is a type of Refinement that involves identifying and providing stimuli that enhance the state of well-being of marmosets and other animals. Enrichment is important for both physical and psychological health. There are several key concepts relating to enrichment including: encouraging natural behavior, increasing complexity and choice while allowing control, novelty and movement. All positive locomotory behaviors and postures: leaping, running, climbing, clinging, hanging upside-down etc. All social activities: grooming one another, resting, playing and huddling etc. A safe, comfortable place to sleep and hide. Complexity provides choice. Choice allows a degree of control and reduces the likelihood of boredom. Marmosets can only choose if they have a range of options presented to them. Complexity can be introduced through ‘enrichment’ in a variety of complementary ways. Enabling an active but harmonious social life. Changing their physical environment. Providing an appropriate variety of food in ways that present a challenge to reach it . Activities that challenge their minds and stimulate their senses. Movement of objects, structures or live animals can be enriching. Movement attracts attention and introduces unpredictability, for example: swings to move and play on, loose objects like feathers to play with, live insects to chase, views through windows of live birds, etc. Novelty and change reduce boredom. Marmosets quickly lose interest in some items. Frequent changes made to the enrichment can sustain attention and interaction. A rotation ‘timetable’ can be arranged so that different options are made available in turn, cycling through enrichment items then becomes easy and automatic for caregivers. While having the opportunity to explore a variety of objects and situations, marmosets should always have the option of removing themselves from the stimuli. It is necessary to evaluate whether or not enrichment has improved welfare. Some enrichment options will work better than others, some will not be effective at all, and some may have unexpected negative effects. Safety is an important consideration when adding architecture or objects to an enclosure. Housing marmosets with other marmosets can be good for welfare. 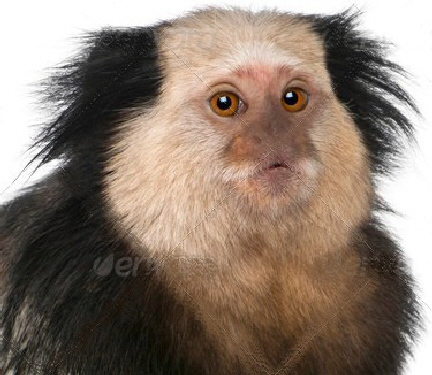 Buffer marmosets against the effects of stressful events. searching for fruiting trees using their memory to help find them climbing and hanging down to reach the fruits and then getting through the tough outer skin to the fruit inside. Feeding affects growth, disease resistance, lifespan, and susceptibility to stress . Food should be presented to the marmosets in a way that encourages their natural food finding behavior: foraging, gnawing, catching insects, finding, reaching and getting into fruit. Introducing new foods and novel textures stimulates the marmosets’ curiosity and interest. Gum arabic can be used as a substitute for tree gum in the wild. Food is often chopped up. However, leaving skin on bananas, apples or other fruits or giving peanuts in their shells increases the time taken, and effort required to get to the food inside. Food should first be washed thoroughly to remove any pesticides. Some novel foods quickly become popular while some are as swiftly ignored! Scatter feed mix can also be placed in an elevated box to allow foraging higher up where marmosets are more active. Marmosets can get bored if food is quick to find. Boredom is a problem because it can lead to a reduction in welfare through increased stress and abnormal behaviors. In the wild a lot of their day is spent foraging for food. Marmosets enjoy working for their food. Bear in mind that a change of hair color, perfume, etc. may mean that the marmosets do not recognize you and may respond as so. Socialization allows a marmoset to become used to you being close to them and them with you. Handling can cause distress to marmosets. To avoid distress these procedures using a technique called ‘Positive Reinforcement Training’. This Training can also lead to other benefits, including reduced levels of stress and boredom for the marmosets, and an improved relationship between caregiver and marmosets. They should only be held down if there is no alternative and only if it is absolutely necessary as with veterinary work or medications. Only hold with a tea towel or wash cloth. Something other then your bare hand. Important: training done badly is even worse than when no training is done at all. It is essential to learn the correct techniques. Excessive self-scratching picking at their hair, biting self, etc. do well with young children or people that work a lot.